First off – I apologize if any of you had tried to click on my link from Facebook or Twitter and got a failure message. I forgot to click Publish. I mean, duh. So, sorry about that! 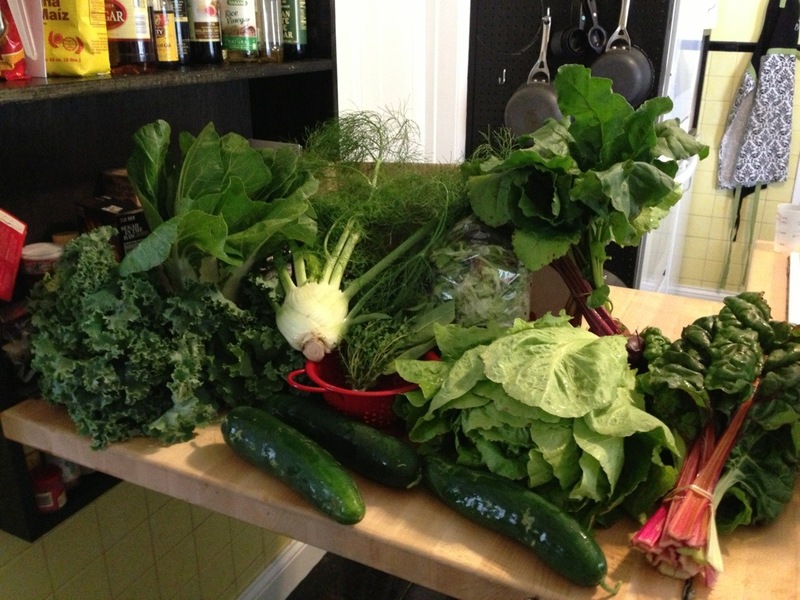 As you saw in last week’s CSA post, we have been swimming, so to speak, in leafy greens. A fellow blogger noted that I was “the queen of greens”. Which I think has a nice ring to it :-D! Nevertheless I had one heck of a time trying to figure out different and creative ways to use up the produce. the beets & kohlrabi have been pickled – recipes to follow if they turn out just right! Thankfully, this week’s harvest gave us a bit more variety, crunch, and er, shapes, to work with? 🙂 We received it on Tuesday, and believe it or not – a good portion of this box has been put to good use already! I am finally starting to get the hang of planning our meals around produce. So far, it has created less waste and has been more friendly on my grocery budget. I just hope that this is a plan that I can stick to! That looks like a great bunch of produce! I can’t wait to get chard in our box.